Abuja People are you ready?? Rise and Grind Boot camp!! Looking to lose some weight, add some muscle or tone up...??? 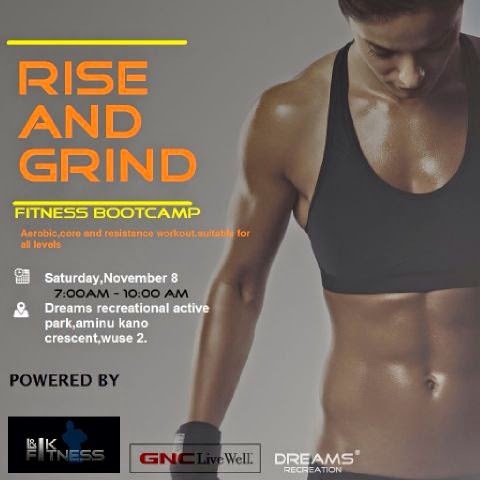 RISE & GRIND is the place to be come November 8th, at dreams recreational active park, Aminu Kano crescent,Wuse 2. "Remember nothing good comes easy" ...RISE & GRIND. Duration: Every Saturday starting November 8th 2014!! Workout involves: Aerobics, muscle toning, resistance and high calorie burning exercises. Come along with your towel and a determined mind. Rise & grind by L&K FITNESS in partnership with GNC performance. Powered by Dreams recreational active park.